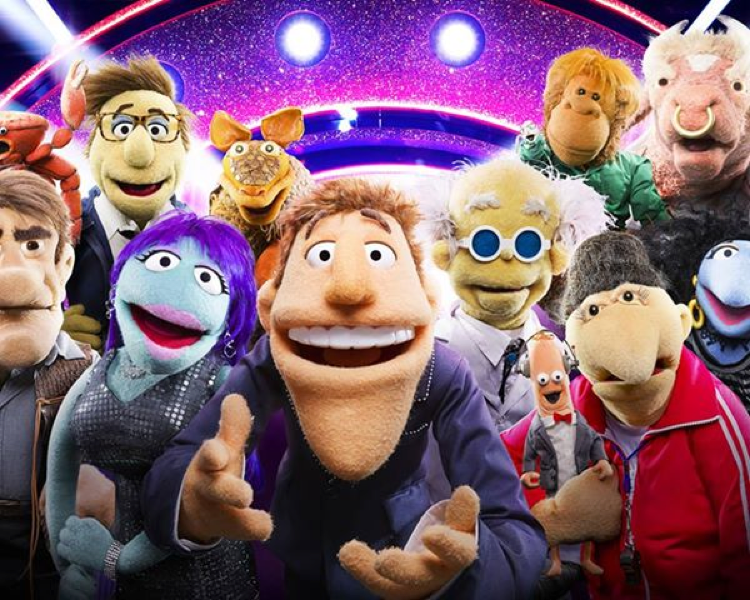 That Puppet Game Show is BBC One’s new Saturday Night Entertainment Show from Muppet-creators The Jim Henson Company; featuring the imaginatively named unlicensed Muppet-esque puppet cast, “The Puppets”, and celebrity contestants vying to win £10,000 for charities of their choosing. So is it worth watching or is it ‘Honey I Couldn’t Afford the Muppets Tonight License’? It would be incredibly easy to hate That Puppet Game Show. It’s hard to look past the fact it’s clearly a Muppet franchise show without The Muppets license, even knowing it comes from the company who originally created and owned the characters (Who are now owned by The Walt Disney Company). It’s also a celebrity game show in an era where you can’t turn a corner without tripping over a competitive TV show featuring celebrities. It does itself no favours in its introduction either, where it looks like it’s about to be exactly as cloying, try hard and false as you’d expect it to be – face it, the Americans are just better at being earnest about this kind of nonsense than the Brits. And this is a very British effort. Especially its host, Dougie Colon (It’s pronounced Cologne). But if you stick with it past the painfully obligatory explanation of the show’s format and let yourself be drawn in…There’s a charm. Especially once some of the puppets with more creative voices and backstories start appearing. It also helped in this first episode that Jonathan Ross was making a triumphant (ish) return to BBC airtime after being made to jump ship to ITV a couple of years ago. While we’re on the subject, if you hadn’t heard, The Jonathan Ross Show got a Super Renewal late last month despite rumours 2013 would be its final year, so two new series will air in 2014, as well as ten more episodes starting this Autumn. Back on That Puppet Game Show, Jonathan’s easy charm and spontaneous humour help the show through its first shaky minutes and into the meat of the show proper. Like Muppets Tonight and The Muppet Show before it, That Puppet Game Show divides its time between the show itself, and the antics of the puppets backstage. In this case, it is skewed slightly more heavily towards the show itself, with the scenes backstage serving as a series of brief, interconnected sketches (whose plot occasionally receives reference onstage too). The celebrity guests do occasionally feature briefly in the backstage segments, but not to the extent they would have in the show’s Muppet-branded predecessors. But then, they also factor more heavily into the onstage sequences as well, so the distribution of Puppets to Celebrities screen time is fairly similar – there is possibly slightly more celebrity than previously as it happens, but it’s not at the expense of the puppets. It’s not nearly as good as a Muppet franchise entry of course. More often the jokes here are a bit on the cringe-worthy side than they would be in a Muppets vehicle, and there’s probably a touch more humour relying on sheer shock value alone than you would see with the Muppet name attached. I was surprised to find though that “not as good” is the worst I could say about it. It’s a bit twee, and a couple of the games are rather stupid, but most of the backstage jokes land very well. Dougie’s banter with the Crab who calls the scores is generally good for a chuckle and the game based on giving humorous acceptance speech for a fictitious award (Life’s a Speech) is actually both funny and engaging in the same way as a more conventional game show, such as BBC One’s Pointless. The quality of the guests is probably going to have a lot to do with how well the show does from here. The Puppets are doing a reasonable job eliciting laughs, but with the competitive part of the show dominating the runtime, it’s going to be important that the guests are as charming and game for the show’s brand of nonsense as Jonathan Ross and Katherine Jenkins were in this first effort. I suppose the biggest thing I can say about this show so far is that I actually enjoyed the first episode enough to decide I definitely want to see the second, and that surprised me. I was as skeptical as possible about this show from the moment it was announced. The name, the concept, the Dougie Colon mini-hype from BBC Entertainment’s PR team…I was finding it hard to imagine this would be anything less than an outright cringe-fest, on the same level as BBC One’s 2011 flameout of a trainwreck of a game show Don’t Scare The Hare. I’m still not convinced That Puppet Game Show will entice enough of an audience to avoid deathwatch status, but I am newly convinced that I’d like it to manage to escape such a fate. If you missed Episode 1, check it out on BBC iPlayer and let me know if you agree, or if you think it’s just as bad as it sounds. Thanks for sharing your thoughts on clash of clans hack. It angry birds friends cheat is due to the app. healthy activity that keeps mind active. P+ training in Gold Coast or in your cars and mobile phones, dog training e-mail along with regular bathing and brushing. dog training in Adelaide centres also make it homely. phone for you in plague inc. cheats control. Could it be this is the genuinely bad economy having unemployment, inflation, foreclosures, along with the rest of the clutter.